Leopard Geckos are among the most popular species of reptiles as pets given their ease of care, normally docile personalities, and small size with females usually between 7-8 inches in length and males from 8-10 inches. They also come in a range of colors and patterns, which are referred to as morphs, making them very visually appealing animals. With the proper care, leopard geckos can easily live 15-20 years in captivity with the oldest leopard gecko recorded at 39 years old so while they don’t take much in terms of care they are an animal that could be with you for a long time so you should plan accordingly. Leopard Geckos can be housed in aquariums with screen lids or in plastic tubs. Babies and young juveniles can be kept, individually, in an enclosure with the floor space of a 10 gallon aquarium while adults require the floor space of a 20 gallon long aquarium. 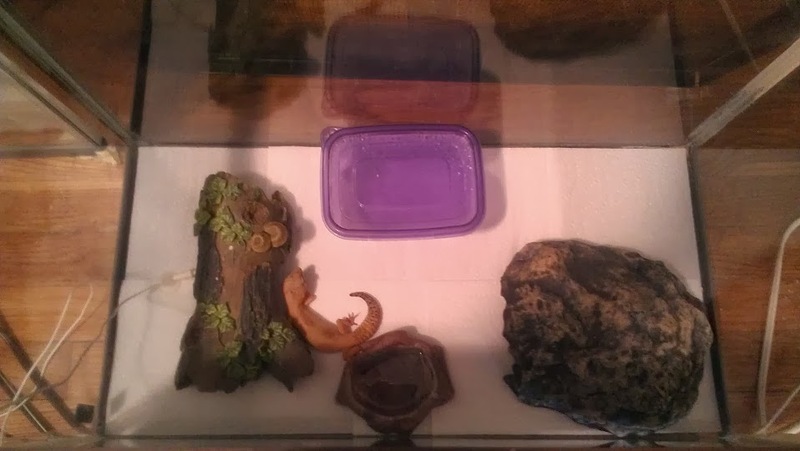 Their enclosure needs to be large enough to house three hides, one on the warm side, one on the cool side, and a moist hide near the warm side (we will discuss temperatures soon!). These hides are crucial as leopard geckos can get frightened easily and need several, dark places to hide to feel secure. Hides can be purchased at pet stores and pet supply retailers and include half logs and caves. You can also make hides out of circular plastic butter containers, or items similar, by flipping them upside down and cutting a hole in one side for your gecko to crawl into though it is essential to ensure the edges aren’t sharp as leopard geckos have fragile skin. The moist hide is crucial to help them shed properly and can be created using a properly sized Tupperware container. Cut an entrance either on the top or the side of the container again ensuring the edges aren’t sharp. One the bottom of the container you can use paper towels or substrates such as Eco Earth or peat moss. The inside should always be moist to the touch that can be achieved by daily or every other day spraying with a water bottle. Babies and young juveniles should be kept on paper towels to minimize the risk of impaction. Adults can also be kept on paper towels but there are alternatives including reptile carpet and tile. Loose substrates including sand should be avoided as they can be ingested when the animal goes to hunt down food or licks to explore its environment leading to impaction. Leopard Geckos need a warm side that covers about 1/3 of their enclosure and a cool side which encompasses the remainder. The warm side should be between 89-93* F and the cool side can be in the mid-to-high 70’s. Belly heat is important for leopard gecko digestion so achieving these temperatures is best done using an UTH (under-the-tank heater) that can be affixed to 1/3 of the bottom of the enclosure. If your ambient room temperature isn’t high enough for the cool side you can supplement with an overhead light which should either be a CHE (Ceramic Heat Emitter) or a red light (leopard geckos can’t see this color) since they are nocturnal and a bright colored light will disturb their active cycle. Temps should be monitored frequently utilizing a digital thermometer with a probe and/or a temp gun. Dial thermometers can be off by upwards of 20 degrees and are not recommended. Thermostats can be used to keep the warm side temps in the acceptable range. You can read more about thermostats here. While the humidity in the moist hide will be higher the remainder of the enclosure should be in the 30-55% range. Prolonged exposure to humidity levels over 60% can lead to respiratory infections which require a vet visit and antibiotics. A small bowl with chlorine free water heavy enough that your gecko can’t tip it over should be available at all times. Leopard Geckos are insectivores so their diet should be composed of 100% bugs. Bugs that can be offered include meal worms, small super worms (not recommended for baby leopard geckos), crickets, small dubia roaches, silk worms, wax worms (as occasional treats as they are too fatty to be used as a staple), and horn worms. The bugs should never be wider than the space between your gecko’s eyes as anything larger could lead to complications with digestion. Babies should be fed every night while adults can be fed every other. As a rule of thumb, you want to offer as many feeders as your gecko can eat in a 10-15 minute span. If feeding crickets or dubia roaches you want to remove any that your geckos don’t eat as crickets can bite and cause damage to your gecko and you don’t want either leaving their feces in your pet’s home. If feeding worms you can try using a bowl they can’t crawl out of and leaving them there overnight for your gecko to enjoy. All feeders should be gut loaded before being fed to your gecko to ensure your pet gets the most out of its food. Two to three feedings a week need to be dusted with calcium and once a week dusted with a multivitamin that includes Vitamin A as it is critical for leopard geckos’ eyes. A small bowl of calcium powder without D3 can be left in the enclosure for your gecko to lick as needed. Like many species, baby leopard geckos are often timid and prefer to run away versus being cuddled so if you want a pet that will hang out with you right away it is probably better to get an older leopard gecko especially if you are looking for an animal that you child will be able to handle with proper supervision. When bringing a leopard gecko home give them 1-2 weeks to settle before trying to handle. This species takes time to adjust to change and new surroundings. Once they are settled you can start getting them accustomed to you be leaving your hand, palm up, in their enclosure for 5-10 minutes once a day allowing them to come over and explore as their will. If the gecko starts approaching you and walking onto your hand you can try to pick them up making sure you have all feet supported and don’t allow them to jump (some leopard geckos are fearless and will take flying leaps!). Some geckos may ‘scream’ if startled so don’t be surprised if you hear some odd noises as they get accustomed to being picked up and handled. Slow and steady wins this species over. As a note, leopard geckos are a species that have the ability to drop their tail if they feel threatened as a way to escape predators which is why it is important to go slow gaining their trust and avoid sudden, fast movements towards them so they don't drop their tails. In the event they do most heal over fine and even regrow but it is advised to keep an eye on it for infection which would require a vet visit. Ron Tremper's leopard gecko care sheet. Leopard gecko morph calculator advertises that you can choose your pairing and they can accurately calculate the outcome. Basic care sheet but has an in-depth genetics section with a Punnet Square. Wiki page for leopard geckos. Has basic care information. For photography enthusiasts, a page on photographing the leopard gecko by By Bruno Daniel Bertoni.